Carol has known me since I was born; she and her family lived opposite my family home, and she went to school with my older sister. I met Alan many years ago when they got together and they have remained close friends of the family. It was a real privilege for me to be asked to take their wedding photographs when they decided to tie the knot in October last year after many years as a couple and two children together. It is always special to photograph friends and family members on their big days, not only as I get to be surrounded by the banter of people I already know very well, but also for the opportunity to capture a memory for them which will last forever. There was a theme throughout the day of stars and moons, reflecting the couple's interest in astronomy and tying in colour-wise to Carol's Scottish heritage. Sumptuous midnight blues and glistening silvers were mixed with thistles, the national flower of Scotland. Carol's gorgeous bouquet contained all of these alongside cream roses, and she spent time with a jewellery designer coming up with this wonderful shimmering star tiara. Last Wednesday evening was a date firmly etched into my diary; I had the pleasure of photographing one of Nibbles 2 Nosh's 'Wedding Experience Evenings.' I have been asked to photograph two of these evenings before, and I always look forward to them. They are an opportunity for couples who have booked Upwaltham Barns as their wedding venue to experience a 'sneak preview' of their big day, and consider decor, music, and of course, what food they might be serving up to their lucky guests. The evenings are always such a pleasure to attend; impeccably organised, beautifully laid out and great fun for me. I shoot a large percentage of my weddings there, and now know many of the lovely staff and am really starting to feel like part of the team. The atmosphere they create at Upwaltham Barns is one of effortless efficiency, coupled with warmth and attention to detail. The fact that it is a family run venue really shows; Tim owns and manages the venue alongside his wife Nicola; his sisters Claire and Kate are the Nibbles 2 Nosh catering manager and wedding co-ordinator respectively; and brother Steve is the bar manager. They work together like a well oiled machine, but with immense pride and consideration, not only in managing and looking after their staff but really going that extra mile for their guests. Together they are friendly, accommodating and fun, and I feel very lucky that they keep inviting me back to be a small part of that! The last time I photographed a wedding there was back in December and the team had been hard at work since renovating Jasmine Cottage where brides often prepare on the day and the couple spend their wedding night, and adding new details to the bar and outdoor areas. I can safely say they have done a fabulous job! The atmosphere was tranquil yet full of focus when I arrived before the guests showed up, at around 4.30pm. 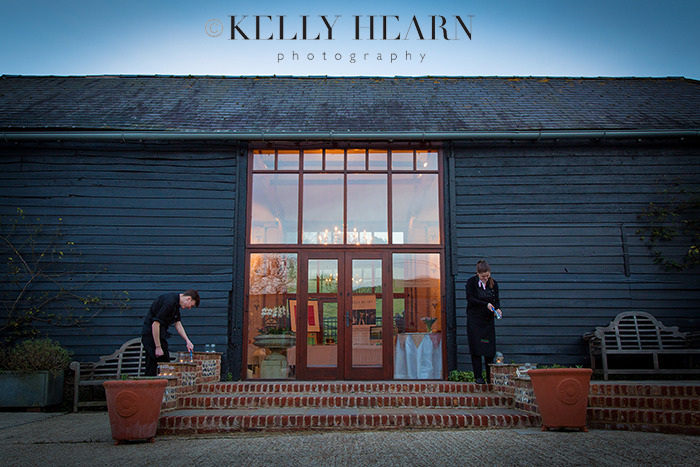 I managed to capture a few images of this 'calm before the storm'; here is the lovely Donna striking a pose beside her newly emblazoned chalkboard, and a couple of the team lighting tea lights to set the ambience outside the barns.